From the top of Whistler or Blackcomb, tantalizing backcountry ski and snowboard terrain stretches to the horizon in every direction. It’s massive, accessible, and begging to be shredded. 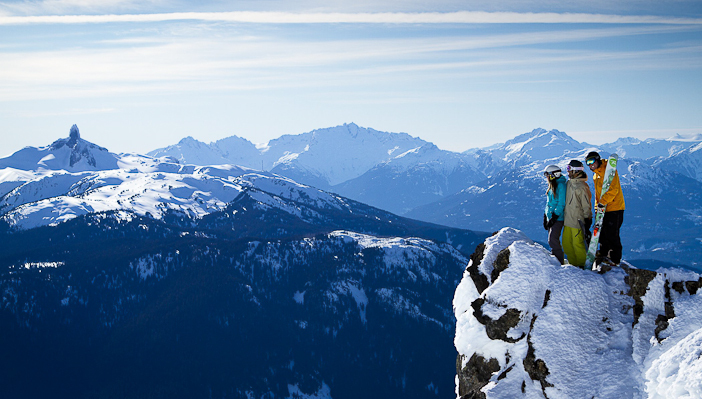 Whistler Blackcomb Extremely Canadian Backcountry Adventures run daily through April, when a minimum of three skiers/riders are booked. You can also book a Private Backcountry Clinic so you can hit the lines you and your guide choose, travel at your pace, and get one-on-one coaching and instruction. With a Private Clinic you can also rally your group of up to five friends/family of similar ability. Photo by Justa Jeskova. Courtesy Whistler Blackcomb. In a full day of mind-blowing guided backcountry skiing, telemarking or snowboarding, the ACMG-certified Guides will share techniques and tactics to hone your skiing, boost your safety knowledge, and heighten your awareness in big mountain terrain. Keith Reid, President of the ACMG and recognized internationally as a senior Guide/examiner with ACMG and IFMGA, is leading this exciting new program with Whistler Blackcomb and Extremely Canadian. Reid knows the backcountry terrain around WB better than anyone, and he’s pumped to share it with more skiers and riders this winter. Advanced-intermediate to expert skiers can enjoy Extremely Canadian Backcountry Adventures, regardless of touring experience. Adventures run daily – subject to weather, avalanche conditions, and meeting the minimum group size. 8:00: Meet outside on the deck of Essentially Blackcomb, in the Carleton Lodge, in the main Village between the gondolas. 8:45: Head up Blackcomb or Whistler Mountain, then traverse with your guide out into Garibaldi Park. 9:30: Avalanche awareness & safety, mountain travel. 10:30: On the move, gathering travel skills and snow safety information as you ski. 12:30: Big line skiing, continued avalanche safety; mountain travel skills training. -End of day back in the Village with tired legs and open eyes. Now you’re eyeing up that untracked line, it’s within reach, and you’re ready to rip. Or is it ready to rip? Avalanche safety and mountain awareness are critical skills to learn and practice frequently. Remember when you head out for the day, you stay out for the day. As a backcountry skier/rider, you will climb many of the slopes you descend. This means physical output is significantly broader than simply riding/skiing inbounds. How you manage your temperature and protect yourself from the environment is constantly changing. This is accomplished by proper clothing and effective layering. Touring skis or split-board, with climbing skins. Ski poles (with powder baskets). Required for both skier or boarders. Waterproof breathable shell jacket (with hood) and pants. Synthetic or Down parka (ideally with hood). Sunglasses (even on a cloudy day). Lunch and water (at least 1 litre).